Halleck is wearing the uniform of the Major General Commanding. His uniform is a regulation frock coat. Notice the three stars on his shoulder straps. Otherwise, the uniform is that of a major general with buttons in groups of three on his coat. His collar is the dark velvet collar of a general officer. Henry Wager Halleck was born on January 16, 1815 in Westernville, New York. By the time of the Civil War he had built up an impressive résumé. He was a Phi Beta Kappa graduate of Union College, third in his class at West Point, author and translator of many works on military science and the law, engineer, administrator, lawyer, businessman and railroad executive . He received the nickname "Old Brains" from his peers. The one thing Halleck was missing was a solid reputation of leading men in battle. At the outbreak of the Civil War he reentered the Army, from which he had resigned in 1854. He was commissioned as a major general of regulars on August 9, 1861. He was placed in command in the Department of Missouri and preformed well. Halleck was also fortunate to have good subordinates, among them U.S. Grant. On July 23, 1862 he was promoted to General-in-Chief (Major General Commanding), replacing George McClellan. Having reached the apogee of his career Halleck slipped. Although a good organizer, he lacked vision, was overly cautious and often obstructionistic. Among his major failures was delaying the arrival of pontoon bridging equipment needed by Burnside at Fredericksburg and thus contributing to the disaster there. Henry Halleck earned a host of negative comments in the private papers of nearly all the men in Lincoln's cabinet. Finally, on March 9, 1864 he was relieved as General-in-Chief and replaced by U. S. Grant. 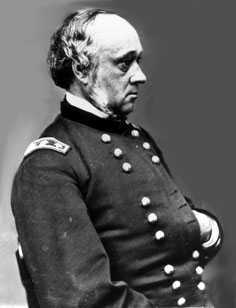 Grant retained Halleck as Chief of Staff, a job Halleck managed reasonably well. Henry Halleck died on January 9, 1872 in Louisville, Kentucky while still on active duty with the U.S. Army.